I had a quick look in the Aettings app but cannot find a way to allow this application that I made. How would I 'trust' this application running iOS 9? 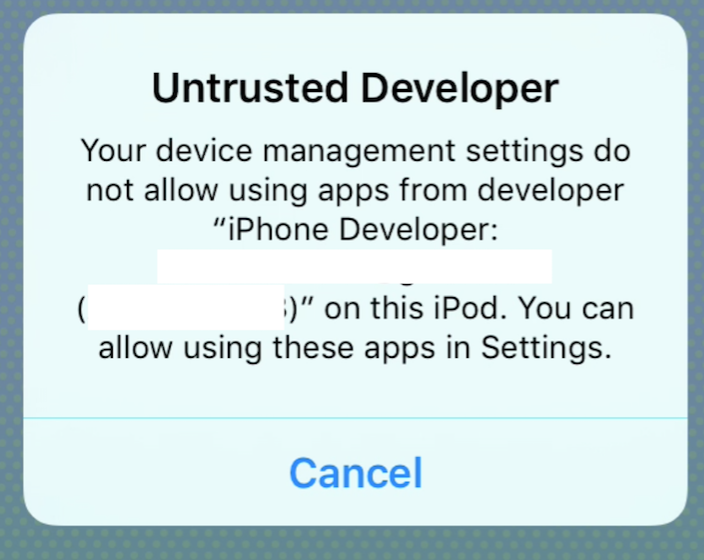 Enterprise and other certificates have to be manually trusted on iOS 9 when they didn't have to on iOS 8 and earlier. If you don't see "Profiles & Device Management" then your device needs to reinstall the app or get the appropriate profile from MDM / other enrollment. For newer versions of iOS >9. Settings->General->Profiles doesn't exist.. You will find the settings you need to change in Settings->General->Device Management. Note: In my case only "Settings > "General" > "Profiles" was shown instead of "Profiles & Device Management", and these steps solved the issue. Yup, this isn't an extreme issue. No need to contact the dev. You can go to the Settings app and it will be resolved in there. See if this here can help. There's a also Xcode solution for this problem. Open Xcode app on your Mac. Select your device and delete the profiles. Delete the installed app on your device. Now rebuild the certificate and install the app again. Not the answer you're looking for? Browse other questions tagged ios applications security xcode . Is it possible to compile and run an Xcode project on a jailbroken device without a paid developer certificate? Isn't XCode meant to be free?